Before investing, visit www.flexshares.com/prospectus to obtain a prospectus that includes the investment objectives, risks, fees, expense and other information you should read carefully and consider carefully. Foreside Fund Services, LLC, distributor. The investment objective of FlexShares Ready Access Variable Income Fund (RAVI) is to seek maximum current income consistent with the preservation of capital and liquidity. This exchange traded fund invests mainly in investment-grade fixed income instruments, including short-term debt securities, notes and other similar instruments issued by U.S. and non-U.S. public and private companies. This bond ETF fund has total net assets of $41.44 million. It has annual expense ratio of 0.25%. The fund is currently traded at premium 0.04% from its NAV. The CUSIP is 33939L886. It has 0.48% yield. The ETF fund has just been incepted in October 2012; therefore it has no rating from Morningstar yet. It has YTD return of 0.83%. The 1-year annualized return is 0.89%. The benchmark is Barclays Capital 1-3 Month U.S. Treasury Bill Index. The top 3 holdings as of November 19, 2013 are Tri-Party RBS Securities Inc (7.86%), Net Other Assets (5.25%) and Coca Cola Co (4.37%). The top sector is Corporate (81.67%) and United States is the top country allocation (71.79%). 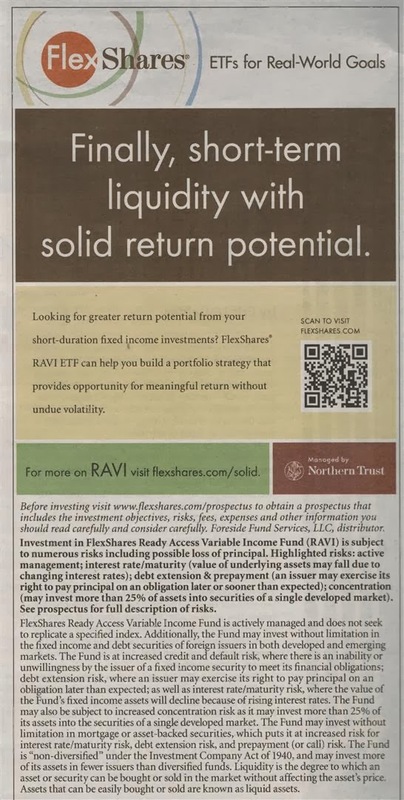 FlexShares Ready Access Variable Income Fund (RAVI) is a new ETF. There is still lack of historical performance to access its potential. The low assets also show that this ETF hasn’t been popular among investors. Please use limit order if you are interested to buy this bond ETF due to low volume.